It is an unfortunate fact that crime occurs every singe day, and even now, as I write this line, something terrible is happening somewhere that we know nothing about or can’t even prevent it. But imagine for a second that you live in a suburban area. You believe that a quiet place to live is almost like living in heaven, where you don’t have to hear the constant noise of a big city. But if you pay careful attention to what is actually going on in that suburb, trust me that will be nothing you have seen or heard before. But getting back to the point of neighborhood, sadly, what has been described in Hounds of Love does not need extra explanation. Reading newspapers or watching tons of documentary films are enough to realize whether we want it or not, Hounds of Love is so close to real life that it’s simply terrifying. Vicki Maloney is a teenage girl who lives with her mother. As they struggle to find a common language due to the separation of her parents, Vicki goes against her mother’s order and goes out at night. A seemingly innocent walk towards her friend’s house, Vicki is abducted by a disturbed married couple, whose specific feelings towards each other shapes everyone’s fate. The opening scene with an intense score captures the eyes of Evelyn and John White, who quietly watch their next victim. What happened with their previous one, we can only imagine. But it’s their friendly approach with diabolic look in their eyes is what appears to be chilling. When they meet Vicki at night, kindly offering her a ride, nothing unexpected is promised. Vicki agrees to get into their car first, and later into their houses from where she won’t be able to come out. As the story unfolds, Vicki watches her abductors to see if she can identify a weak spot In one of them to ensure she won’t get killed. But as the complicated relationship between Evelyn and John advances so rapidly, you might get nervous even by looking at them. Their insanely unpredicted attitude, Evelyn’s entire support to anything her husband does makes you just quietly wait for a deadly ending. But the thing is, in the situation you find Evelyn, John and Vicki, you will realize only the one who masters the cat-and-mouse game will have a slight chance to take a lead in this psychological game. But Vicki’s problem is, no matter how good she might be at that, John and Evelyn are a whole different case, believe me, you would really want to study. 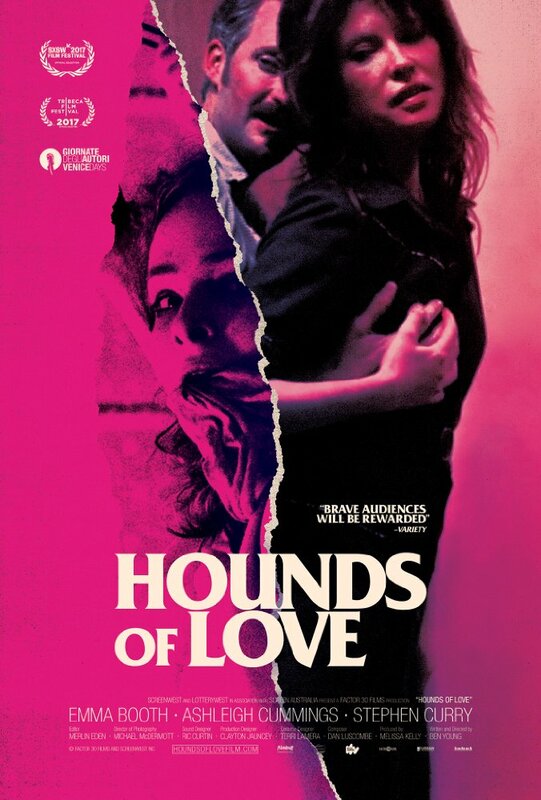 In conclusion, Hounds of Love is an excellent psychological thriller every one must see. It delivers almost like a real time experience of how human nature can change so significantly. It captures so delicately the way a disturbed mind can be manipulated. It’s also, which again is what happens nowadays, the police’s response to Vicki’s disappearance. The performance delivered by the lead cast is so great that you would continue following their work afterwards. In the end, but not the least, Hounds of Love is about being held in captivity, being stubborn and determined, about ability to give analysis to a crucial and dangerous situation… and the last, it is about neighbors that we know nothing about, and us, like you and me, that never attempted to knock the door when it’s required….